VinciLab data-logger is a modern and advanced mobile graphic data collection system, which can be used standalone and with a computer, in the classroom and in the field. It is a handheld Linux device equipped with two processors, a main processor to control the device’s operating system and screen, and a measurement processor to control the measurement at sampling rates up to 1 MHz. 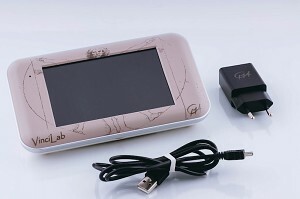 VinciLab has a 5” (capacitive) color touch screen and is equipped with Wi-Fi and Bluetooth. When working with VinciLab as a standalone device, VinciLab is controlled by its touch screen and power button. The dedicated desktop applications offer tools for setting up the device, setting up the wireless connections, managing user files, browsing the web, watching video files, reading text files, etc. Powerful Coach Application, offers live sensor data displays, real-time graphing, tools for data processing and possibilities to create or open ready-to-go student activities enriched with texts, images and web-pages. By using wireless and the Virtual Network Computing protocol the VinciLab’s screen can be remotely viewed and controlled from any computer or a mobile device connected to the same as network. When VinciLab is connected to a computer it is controlled by the Coach 7 or Coach 7 Lite software running on the computer. This is possible as well when VinciLab is connected to the computer via a USB port as when it uses wireless communication via a Wi-Fi connection. For connecting sensors VinciLab has four analog and two digital BT inputs, which allow very fast data collection with up to 1,000000 samples per second (also simultaneously). CMA BT sensors can be directly connected to the sensor inputs. Two additional sensors, an internal microphone and 3-axis accelerometer, are built-in. VinciLab is delivered together with Power adapter, USB cable and VinciLab Quick Guide. More technical specifications about VinciLab you can find in VinciLab User's Guide and in the VinciLab folder.